Sawasdee-kap. We’re reporting from the 2019 Bangkok International Motor Show (BIMS) and kicking off our live coverage from Impact Muang Thong Thani is the new 2019 Honda Accord, which was officially launched in Thailand last week. From what we can see so far, this is the biggest car at BIMS 2019 in terms of mass market relevance. First revealed in July 2017 in the US, the tenth-generation Accord for our region ditches the 2.0L and 2.4L naturally aspirated engines from the previous generation for a 1.5 litre turbo engine and a 2.0 litre hybrid version. 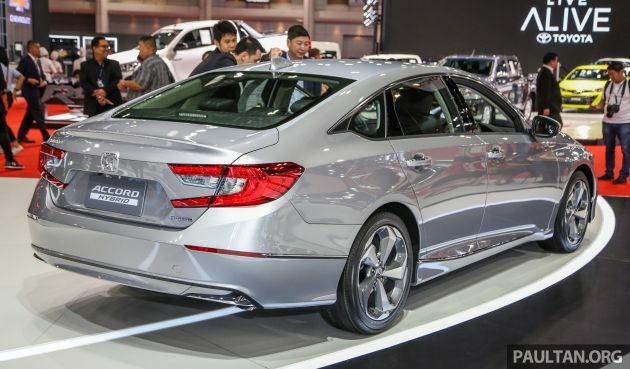 There’s no base NA variant, so the Accord starts at a higher price than the Camry and Teana in Thailand. Similarly, the old car’s five-speed torque converter auto is no more – the range is now CVT-only. By the way, push button gear selection is only for the 10-speed automatic transmission, like in the nine-speed auto CR-V; the CVT that ASEAN gets come with a regular lever. The 1.5 litre VTEC Turbo engine, as used in the Civic and CR-V, puts out 190 PS and 243 Nm of torque from 1,500 to 5,500 rpm in this application. This is essentially the “CR-V tune” of the engine, which is stronger than the 173 PS/220 Nm in the Civic. The new Accord Hybrid with the Sport Hybrid i-MMD (Intelligent Multi-Mode Drive) system combines a 2.0 litre naturally aspirated i-VTEC engine with two electric motors. The Atkinson cycle ICE makes 145 hp/175 Nm, while the pair of e-motors make 184 hp/315 Nm. Total system output is 215 hp, delivered by a CVT auto. The more compact lithium-ion battery pack slots under the rear floor, as opposed to in the previous car’s boot. The new 2019 Accord won’t be mistaken for the old one, as it boasts a fresh new look with a sweeping roofline. At 4,920 mm long and 1,860 mm wide, the new sedan is 10 mm shorter and 10 mm wider than before. That roofline sits 15 mm lower than before, while the 2,830 mm wheelbase is a significant 55 mm longer. The centre of gravity is 10 mm lower than before. The Accord Turbo EL, which is the new entry level variant, comes with 225/50 R17 rubber, whereas the Hybrid rolls on 18-inch wheels with 235/45 tyres. 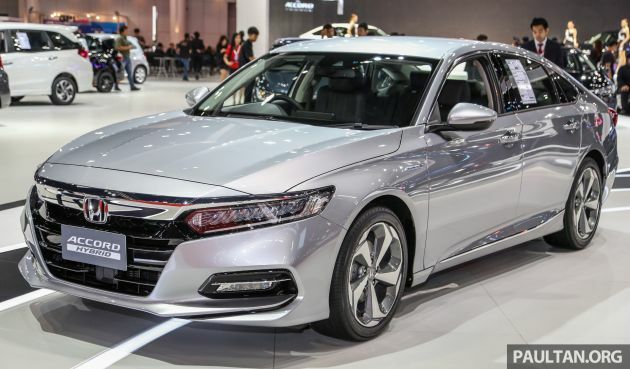 As Honda’s flagship sedan in these parts, the Accord Hybrid will come with the full Honda Sensing suite of safety features, including Collision Mitigation Braking System, Lane Departure Warning, Road Departure Mitigation and Adaptive Cruise Control with Low-Speed Follow. As for equipment highlights, the new Accord is available with goodies such as a head-up display (HUD), seven-inch TFT multi-info display and wireless charging. Three variants are available in Thailand – the Turbo EL for 1.5 million baht (RM192,844), the Hybrid for 1.65 million baht (RM212,129) and the Hybrid Tech for another 150k baht (RM19,282) extra. The Hybrid Tech comes with all the bells and whistles, including a sunroof, exterior door lighting, a rear spoiler, red or black leather seats (depending on the chosen exterior colour), HUD, four-point front parking sensors, rear parking assist with four sensors, 360-degree parking camera, cross traffic monitor and Honda Smart Parking Assist System with auto parallel and perpendicular parking. We also see “boss buttons” on the front passenger seat – a really useful feature introduced in the segment by the Toyota Camry – and manual rear window shades on the top Hybrid. There’s also a Modulo kit for the Accord, which we’ll check out later. Here in Thailand, the Accord Hybrid us up against the Toyota Camry Hybrid, which has a 2.5L engine and is priced from 1.639 to 1.799 million baht (RM210,659 to RM231,223). The new Accord is sure to reach Malaysia, but it won’t be so soon, as the new D-segment sedan will require local assembly. For now, what do you think of the new Accord’s fresh looks and powertrain options? 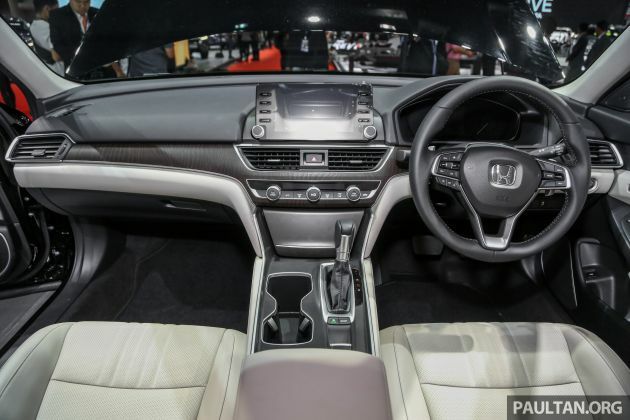 The post Bangkok 2019: New Honda Accord 1.5L Turbo, Hybrid appeared first on Paul Tan's Automotive News. 0 Response to "Bangkok 2019: New Honda Accord 1.5L Turbo, Hybrid"